Clive Barker's promised foreword wasn't included in the galley sent for review, but the aura of terror and dread underpinning these 31 tales of the supernatural by the French writer (1850-1893) highlights Maupassant as a stylistic/spiritual influence on Barker and his school. 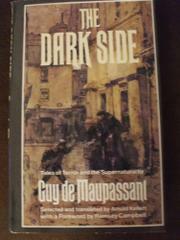 In turn, Maupassant, as is clear from stories such as the necrophiliac "The Hair" ("Ah, the dead do return! She has returned! Yes, I have seen her, I have held her in my arms, I have possessed her. . ."), was heavily influenced by Poe; and if these stories, newly and ably translated by Kellett, lack Poe's perfection, they do include at least one classic--"The Hand," about a severed hand that creeps and strangles--and a host of other dark-tainted tales (the later ones reflecting Maupassant's slide into syphilitic madness) that will please may horror fans, especially those who like their atmospherics thick and trembling.